How many times do you actually treat yourself to a gift at Christmas? I know that as a busy working mum, for me, Christmas is about my children and family, but hey! I need some pampering too! 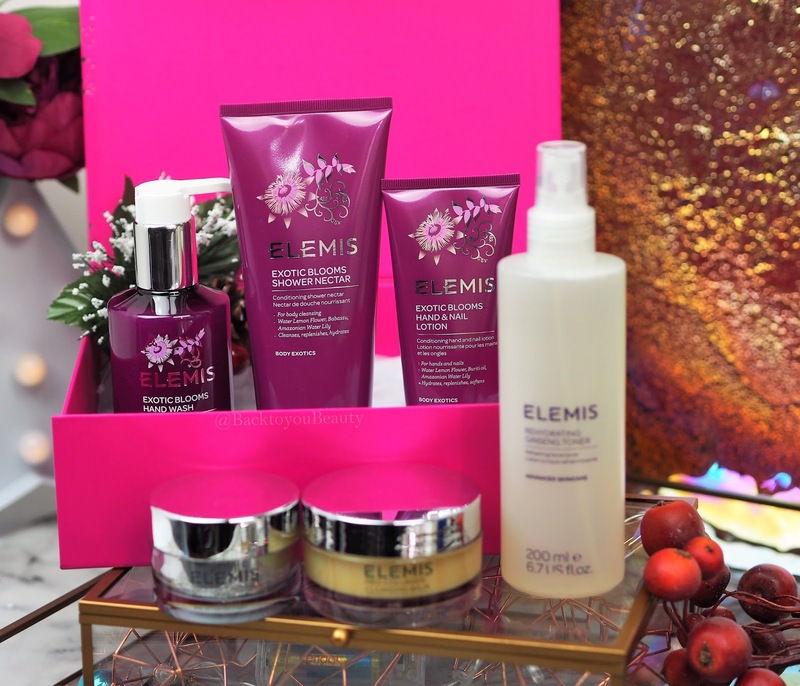 This is where The Gift of Gorgeous Skin 6 piece Collection by Elemis comes in! 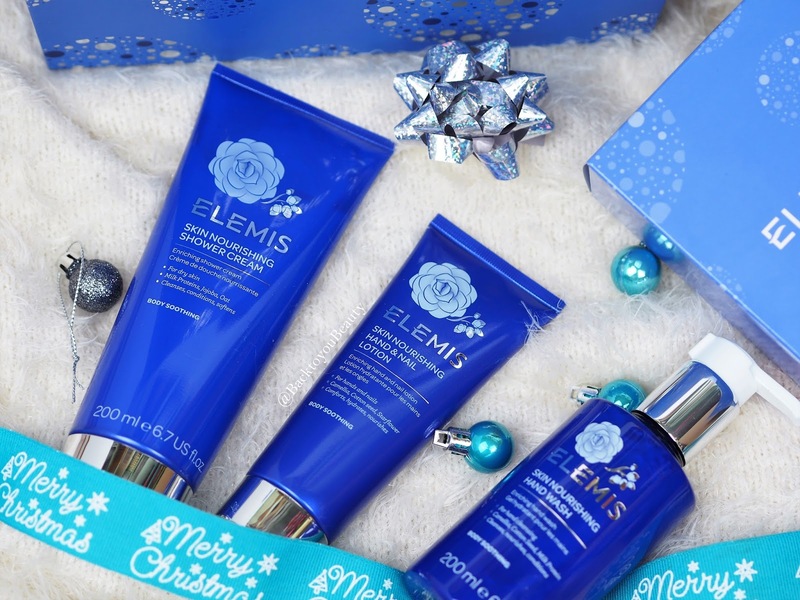 Now this is where Elemis get incredibly generous with their Christmas Tsv collections, as they are again offering a choice of two gorgeous scents. 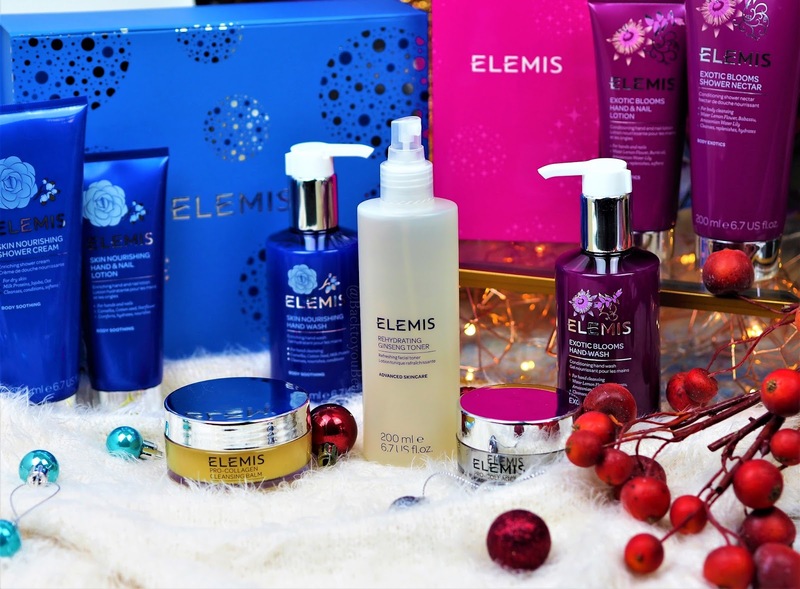 Each collection comes beautifully gift boxed, in official Elemis Christmas packaging, and inside contains Pro-Collagen Cleansing Balm, Rehydrating Ginseng Toner and Pro-Collagen Marine Cream. 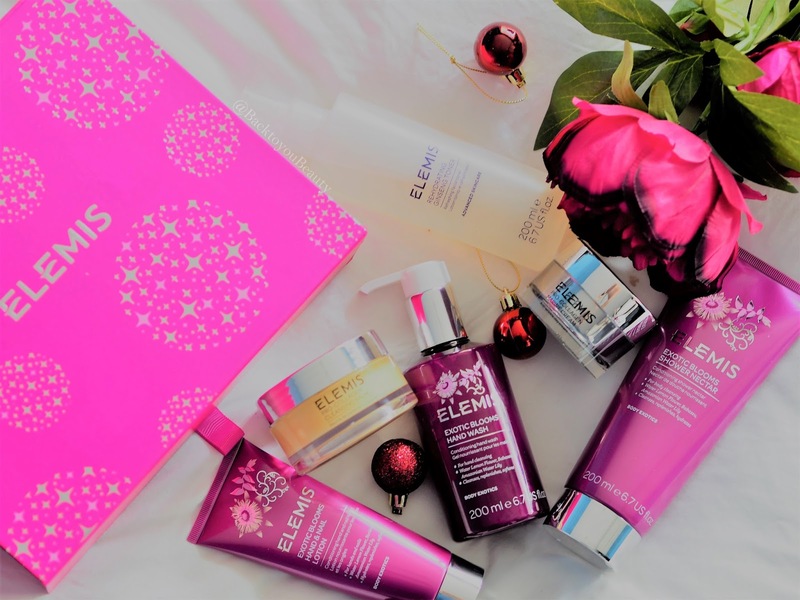 Then you have a choice of the Skin Nourishing collection, which is the blue box, or the Exotic Blooms collection which is the fuschia pink box. In each of these ranges you will receive a Shower Cream/Nectar, Hand Wash and Hand & Nail lotion. Picture the scene….you have had a very busy, yet beautiful day, whether that be Christmas day or any other day. You may be feeling a little tipsy, tired or emotional and want to roll into bed without removing your make up. No! No! NO! NO! It is time to take a quiet moment for yourself and quickly yet thoroughly, cleanse your skin with a product that not only washes away the day, but makes your skin look nourished and hydrated. This is for you! I find this award-winning cleanser so relaxing and such a pampering treat every time I use it. Rose and Mimosa waxes are infused with nourishing Elderberry and Starflower oils and supercharged with anti-ageing algae, Padina Pavonica. As soon as you open the pot, you know this is a luxurious product. It has a gorgeous spa-like scent, that relaxes the senses and makes cleansing the skin a really nurturing time. I warm about a 10p size in my hands and gently massage it into my skin, my face, neck, and décolleté. It smells absolutely amazing and really hydrates and cleanses the skin deeply. I then add a little water and rub this over the balm, loosening it and turning it almost milky, then wet a flannel with warm water and gently wipe away. It literally removes every single trace of dirt, grime and make up and leaves my skin feeling beautifully soft, clean and plumped. It is also wonderful layered on the face and just left to soak in as a mask. I do this when I am relaxing in a warm bath, as a pampering ritual and then gently wipe away any residue. Feels amazing. One of my absolute top cleansers ever. A product that I had never tried before, but one that is perfect for all skin types, but even more so, a dehydrated, mature skin. 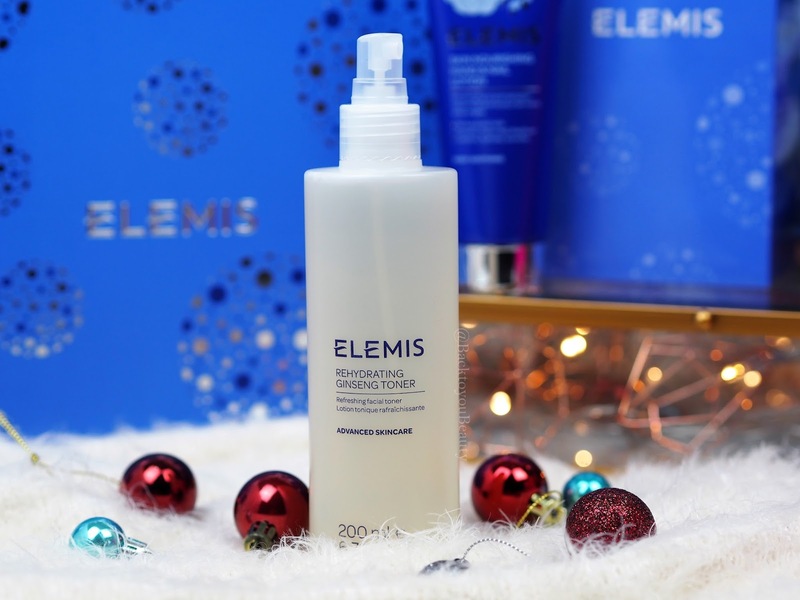 Rehydrating Ginseng Toner is a great multitasking product that smells very fresh and bright and adds a layer of almost silky hydration to the skin. As we get busier within our daily lives, our skin can loose its radiance and sparkle and become dehydrated, the spritz applicator on this bottle makes it great for a speedy all over application, at any time of the day when your skin needs a bit of a pep up, or you can apply it to cotton pads and gently sweep it over the face, neck and décolleté, taking your time and enjoying the moment. Containing Sweet Betty Flower, extracts of Korean Ginseng and Quillaja Wood it really revitalizes the skin, tightens the pores and hydrates whilst making skin appear brighter. A great product to whip out of the fridge Christmas afternoon when the steam from the brussel sprouts is wafting all over your face and the prosecco hasn’t had time to kick in. Please note: This product is for all year round and not just Christmas! This cream makes my skin sigh with happiness (really) and is the perfect base for make up. Pro-Collagen Marine Cream has been clinically proven to reduce the depth of wrinkles, improve firmness, tone and hydration in 15 days! The texture is so light and cooling and really sinks quickly into the skin leaving no residue. You only need a small, pea sized amount, gently warmed in the hands then just massage it upwards over the face, neck and décolleté. In the beginning I used slightly more as my skin was so dehydrated and I felt that I needed it, but with regular use, that really is enough to cover that whole area. It melts in immediately and keeps my skin deeply hydrated all day long. I would highly recommend this product if you are concerned about fine lines, wrinkles and hydration, it’s a no brainier. Suitable for all skin types. Next comes the exciting body products depending on which range you have chosen from Skin Nourishing or Exotic Blooms. The Exotic Blooms fragrance – This actually makes my mouth water! This fragrance is so uplifting and happy and exciting and everything I want an exotic fragrance to be without any of that heavy, headiness. This is fresh and fruity and floral and oh so beautiful! It is a fruity-cocktail-party-night on a tropical island type of scent. It reminds me of a fragrance I used to adore, Escada Rockin Rio so if you have that you will have an idea of the scent. The fragrance contains Water Lemon Flower (a very perfumed fruit flower) Babassu (a Brazillian Palm) and Amazonian Water Lily. This is a very playful scent that will uplift you and make you smile, it lingers and is such a happy, happy scent. 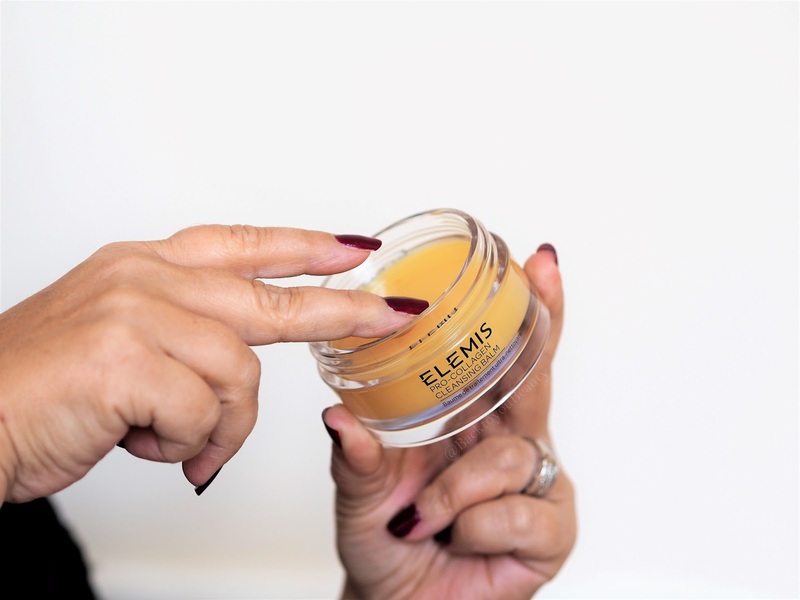 Skin Nourishing scent – This is that cocooning, nurturing scent that we have come to know and love from the Elemis products such as the Skin Nourishing bath milk. Enriched with Camellia, Cotton Seed and Milk Protein, this scent, calms the mind and relaxes the body, is very unisex and a very ‘White’ scent as I like to call it. If you love that baby powder, clean cotton, warming, tension releasing type of experience, then this is the choice for you. HandWash 200ml – The hand wash in both fragrances, foams into gentle, soft, creamy bubbles and gives that perfect clean. They both leave the scent of your chosen aromatic blend, which is not too strong but just enough to know who has or hasn’t washed their hands! 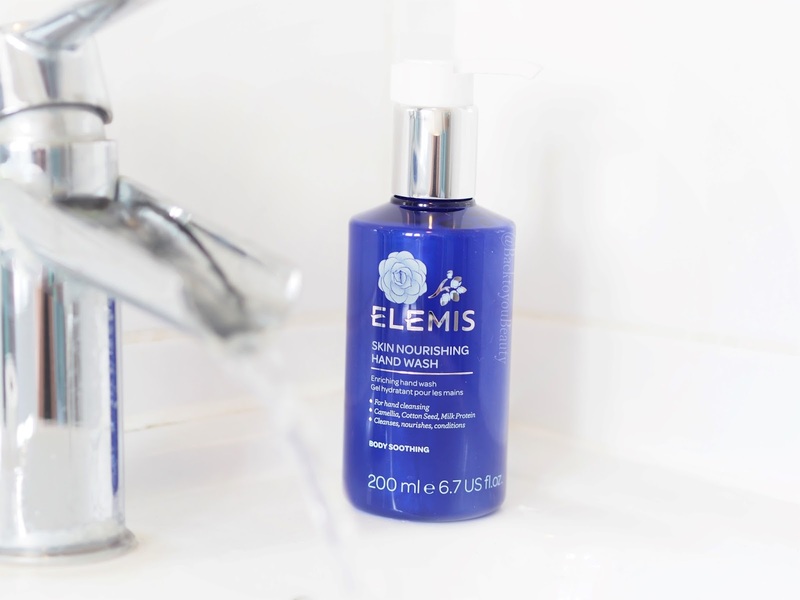 Hand & Nail Lotion 100ml – If you struggle with dry hands because you are constantly washing them, always busy and on the go, then these Elemis Hand & Nail Lotions are perfect for you. They are deeply nourishing on the skin whilst also feeling quite light in texture, due to them being a lotion and give you a lovely burst of gorgeous scent each time you use them. The skin nourishing Hand & Nail lotion is particularly lovely to massage into the hands and forearms of anyone that suffers with painful joints. Not that it will magically take the pain away, but it smells comforting and soothing and just feels so lovely. They both soften the cuticles and leave the nails shiny and hands hydrated and smooth looking. Shower Cream/Nectar – Both products have a place in my bathroom and it will be honestly hard for you to choose a scent. Skin Nourishing shower cream has been loved within my household for many, many years, from my youngest to my eldest son and my husband, the minute I stock up with a new one of these its gone! For them they are happy to use it all day every day, as it is very unisex, fresh and clean smelling. Skin Nourishing shower cream is rich in Camellia, Macadamia, and Jojoba oils and cleanses and moisturises the skin in one easy step. The smallest amount makes the hugest lather and covers your body in creamy luxurious cleansing bubbles… coating you in a warming hug and leaving you smelling delicious! For me, this would be my evening choice to use in the bath or shower to wind down from the day. Exotic Blooms Shower Nectar is just as luxurious and pampering as the Skin Nourishing cream, a little lighter in texture and is my morning, get up and go, looking fresh, feeling fresh, smelling fresh go-getter kind of scent. I know that I can shower and get ready fast without the need for a body lotion if I don’t have the time. Also, as much as this is a tropical, floral scent, my day fragrances layer beautifully on this and do not clash. Gift Giving – Both collections come with a very handy gift box inside the main presentation box which makes this collection ideal for breaking down and creating other gifts, so whether you choose to keep the skincare and give away the Hand Wash and Hand & Nail Lotion is entirely up to you. I love that additional touch, especially as we all love to give generously and now we can, without it being expensive. 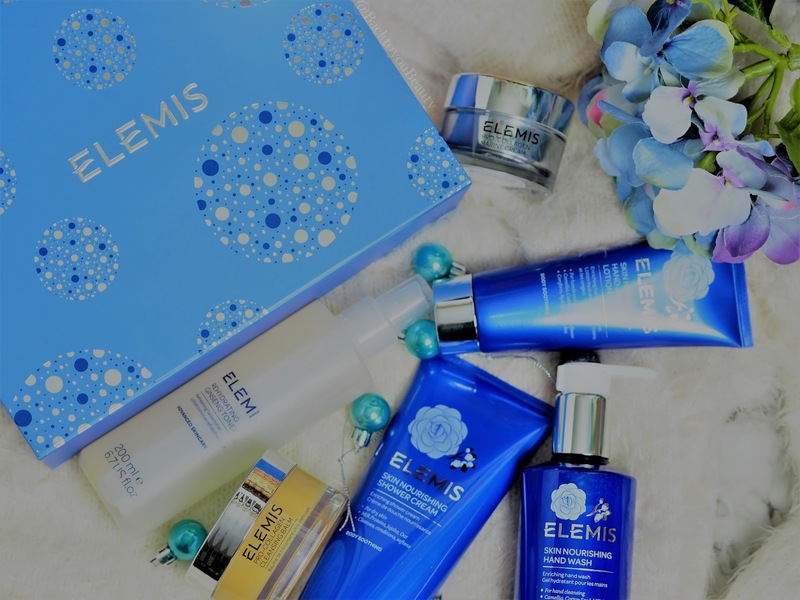 The main presentation box is very sturdy and big and decorated beautifully with the Elemis logo and snowflakes. My Thoughts on this collection – If I absolutely had to choose a fragrance for myself it would be the Exotic Blooms collection, a Limited Edition exclusive to QvcUK I say get it whilst you can and enjoy the happiness. If I was giving as a gift for a couple, a male or someone whose skin really needs that pampering and care, I would give the Skin Nourishing collection. Either way, whether this collection is for you right now, or as a gift at Christmas, I believe you will be thrilled with not only the contents and the value, but the hours of pampering that The Gift of Gorgeous Skin gives. It really is the gift that keeps on giving. These collections are exclusive to QvcUK only as a Todays Special Value on November 12th 2017. Each collection contains 6 items with 3 being skincare and three being your choice of products as shown above from either the Exotic Blooms which comes in the pink box or the Skin Nourishing which comes in the blue box. The price of this collection is an incredible £44.96 which is a saving of £105.00 if bought individually. That is outstanding value. There will be an early presale link HERE on Wednesday 8th November. Do not miss it!! "It Cosmetics – Your top 5 Superstars Holiday Make Up Collection"
"Tarte Launch their Christmas Holiday line in the UK – Get it before its gone!" I was just looking through my stash of Elemis/other skincare and body care and thinking I really won’t need anything except maybe a cleanser for at least a year and then I read this. The value in this set justifies the purchase for me. I would need the cleanser so why not just get it for the small extra cost. Now to choose which option! Thanks for the great blog, Sharon. I adore Elemis and can't decide which scent to choose. I think it may have to be both. Great blog Sharon. I love Elemis especially the skin nourishing range. I have got quite a lot in my cupboard already but it would be silly not to have this. May have to have both sets as Mom has said would you like one for Christmas. Can't say no to that. How flippin’ gorgeous are these sets?! I love the look of the exotic blooms range – so pretty! What amazing value. I don’t think any Elemis groupie (me!) could resist it. Great products – staple and pamper, with an excellent review for those who may not be so familiar. Thanks. What a lovely blog Sharon! I love Elemis and am more of a Skin Nourishing girl. I've not treated myself to an Elemis set in so long, today may be the day!